With 2015 drawing to a close, we looked back on some of our favorite photos and events from the year. We here at SpinSheet thought it would be fun to look through our galleries and share our best smart phone photos of 2015. We asked, and SpinSheet readers answered. The 18th annual Maritime Republic of Eastport (MRE) Tug of War took place on Saturday, November 7. The Broad Bay Sailing Association (BBSA) has the right idea when it comes to regattas, if you ask us! 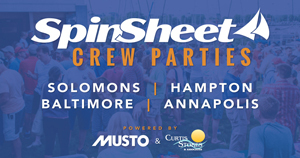 SpinSheet photographer Al Schreitmueller is always up for tall ship fun. What an incredible weekend of racing to close out the 2015 season!